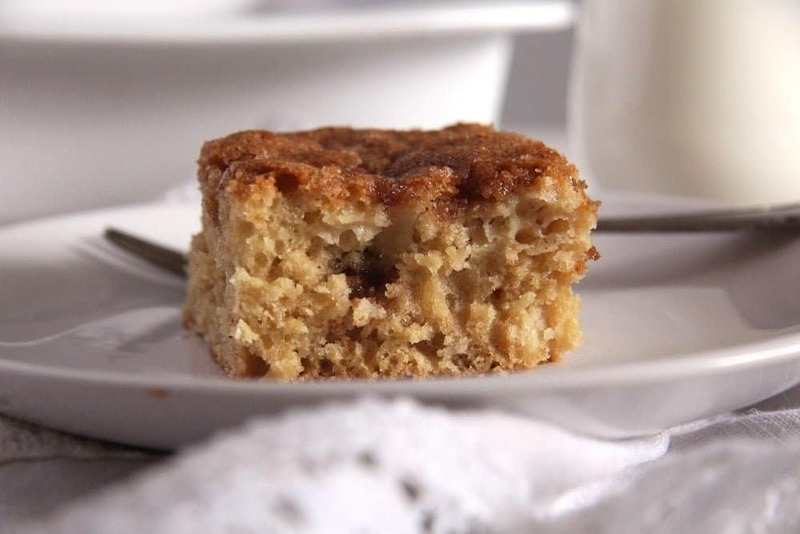 Tender cake with apples, cinnamon and a crunchy sugar topping. Secret Recipe Club time again. This time with a sweet, simple cake, something to bake together with your children on a rainy, Sunday afternoon. Chop some apples, stir a few ingredients, the kids will have a great time and the result will be well worth it. Such a great combination of tender crumb, soft and aromatic apples and then that sugar crunchy crust, which is just the best! 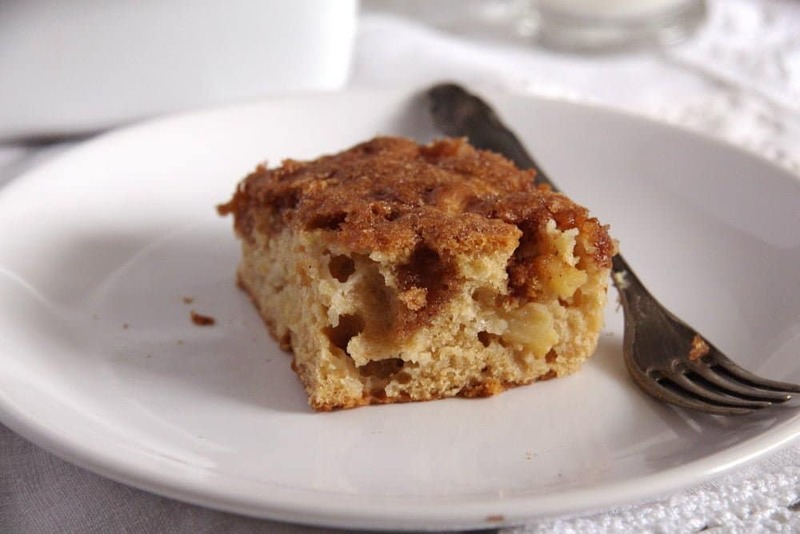 I chose the recipe for the Cinnamon Sugar Apple Cake from the many many recipes found on my assigned blog this month: The Pajama Chef. I was looking for something with apples and Sarah’s blog is full of them, I really had a hard time choosing. Actually I ended up making two recipes, because I just couldn’t decide. Both were delicious, but this sugar cake was a whole family favorite, my mother-in-law just couldn’t stop eating! The other recipe I made were these wonderful Peanut Butter Apple Oatmeal Cookies, which I can totally recommend as well. Sarah is a peanut butter and cats lover living with her husband Ben in Nashville, Tennessee. She’s an academic librarian, which I have to admit is a job I would like to have myself. I love books and libraries, so that would be ideal for me. She’s been running The Pajama Chef since 2010 and her blog is full of great recipes. Some that I would like to try are the Chicken Enchilada with Green Chili Sour Cream Sauce , The Best Ever Homemade Pizza, The Lemon Crinkle Cookies or the Caeser Salad with Fried Chickpeas. Make sure to visit Sarah’s blog, I am sure you will find many recipes you would like. Preheat the oven to 160 degrees Celsius/ 325 degrees Fahrenheit. I used a ceramic casserole form 22x33 cm/ 9x13 inch, which I placed in the cold oven before turning it on. I find this to be good when baking in ceramic forms, otherwise I find that the dish needs a longer baking time than it would need in another kind of dish. You will not need to do this if using a regular cake pan. Whisk together with an electric mixer the brown sugar, oil, egg and buttermilk. Add the baking soda and the vanilla extract. Mix in the flour and then the chopped apples. Melt the tablespoon butter in a small pan. Remove from heat and add the granulated sugar and the cinnamon. Stir to mix. Take the casserole form out of the oven (if you decided to use a ceramic dish as well). Place a small knob of butter into it and move it around the dish with a brush to grease the form all over. Pour the batter into the dish. 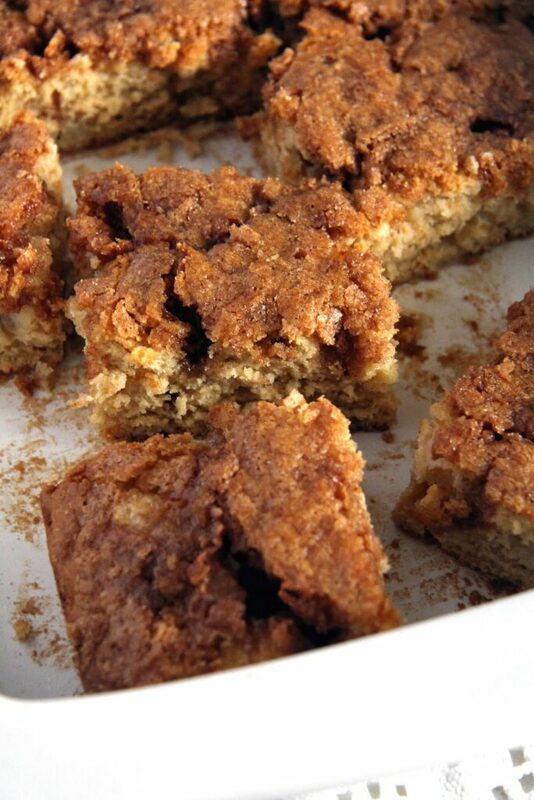 Top with the butter-sugar-cinnamon mixture. Place back in the oven, but don't forget the dish is already hot (I forgot and burned my fingers). Bake for about 40-45 minutes or until a deep golden brown. You can serve the cake warm or at room temperature. It’s too bad that the Secret Recipe Club is closing! I would have eventually liked to have joined the club. I’ve been enjoying your posts and discovering new blogs. I’m wondering if there is another group similiar to Secret Recipe Club? I bought some apples over the weekend and might need to make this cake! Great SRC recipe! Oh well that stinks that the SRC is closing! I’d say you picked a fabulous recipe though to be one of the last you feature from the SRC! This cake looks delicious! I’m a HUGE fan of anything with apples, cinnamon and sugar!! Cheers! This looks delicious! just perfect for apple season. Both of those recipes look amazing! Love the fall flavors of the cake. This apple cake looks absolutely amazing. It seems to have just the right ratio of soft cake to crunchy crust. Wonderful SRC post! 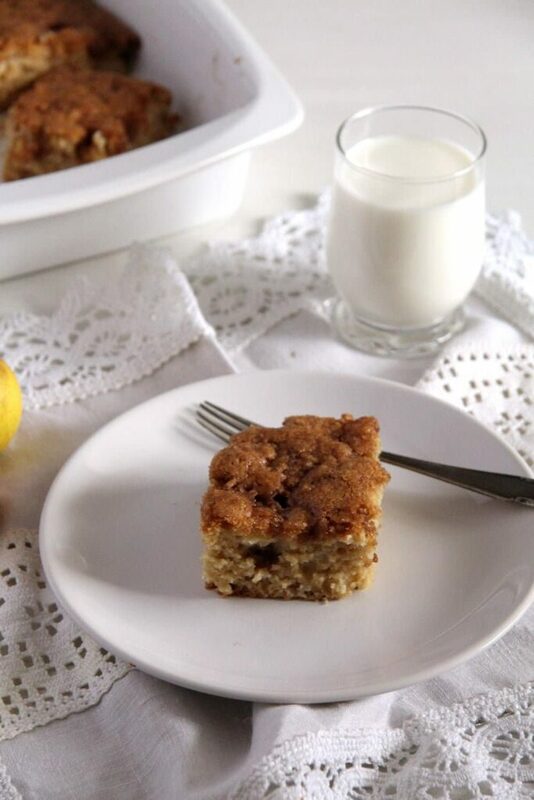 I love the moistness apples lend to a cake, and that sugar crust topping sounds perfect. 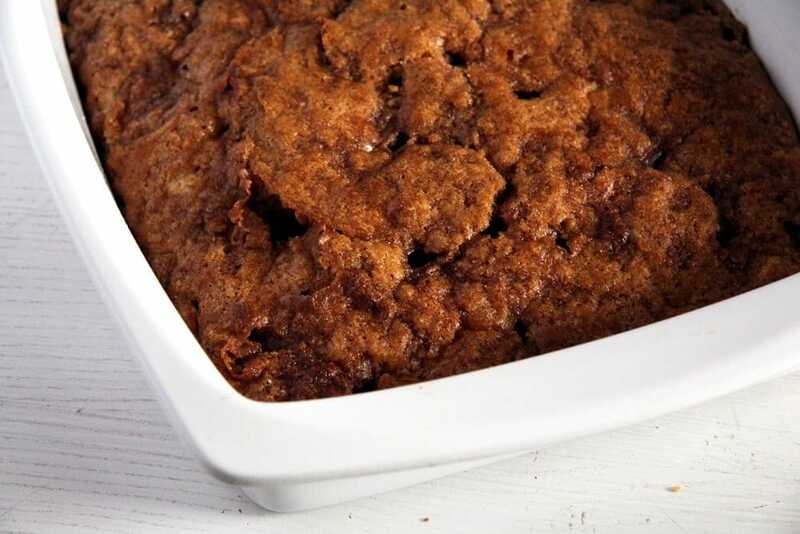 What a great Fall dessert. Just went through all of your recent apple posts and I’m having a hard time deciding which one I like the most. I want to make them all! 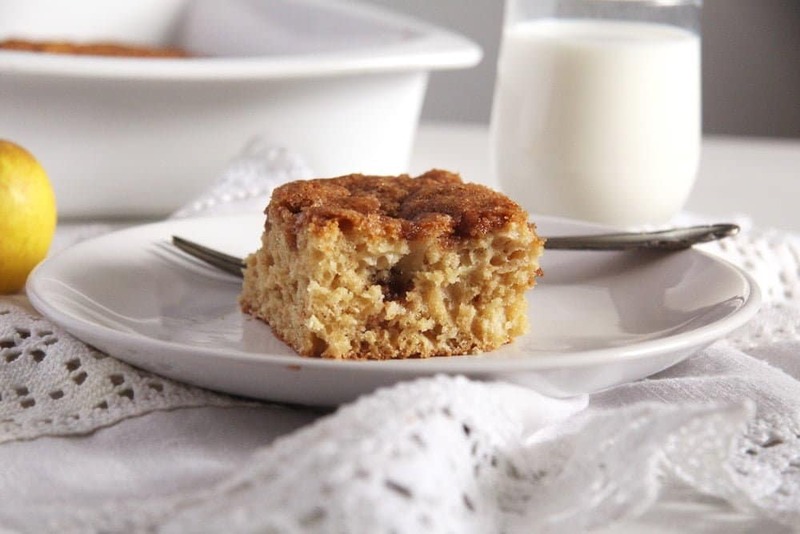 This cinnamon cake and the pastry rolls look quite irresistible! Thanks for all of these recipes!